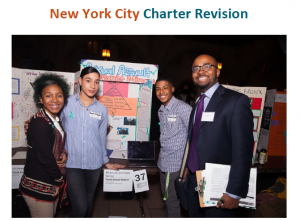 Lesson Plans for Teachers: NYC City Charter Revision Commissions! Generation Citizen created this rapid response Lesson Package for teachers to implement in their 8th to 12th-grade classrooms in order to both ensure a more informed local population and engage young people in this important local political procedure. Over the next year, New Yorkers will have multiple opportunities to share their input and shape the future of the City Charter; however, a large portion of New Yorkers are not aware of the importance of the City Charter and the Charter Revisions Commissions.